When a tooth is damaged by decay, abscess or fracture, a root canal treatment can retain your original tooth and prevent the need for extraction. Think of a root canal treatment as just a longer filling appointment. This is a pain free appointment to help save your tooth. This treatment can help prevent premature tooth loss and, when combined with a dental crown, it will restore the function and comfort of that tooth, giving you back your natural smile. The most common indicators of a serious problem in your teeth are high sensitivity to hot or cold temperatures, pressure, and pain or swelling in your gums. However, some patients never experience any obvious symptoms, which is why it’s imperative to have regular check-ups every six months and receive quality dental services in a timely manner. 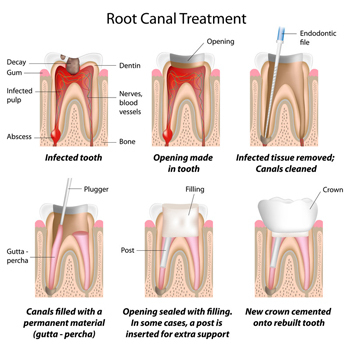 In the same visit the root canals are filled and sealed off to prevent any leakage down the canals and a filling or crown is placed to protect the tooth. In some cases a crown will be required to hold the weakened tooth together. Don’t Allow Problems to Escalate! If you’re currently in pain or have overly-sensitive teeth, don’t wait to contact us in order to set up an appointment to fully diagnose your condition. We will happily communicate with you all the various quality dental services available to save your smile and return your teeth to their former function and comfort levels.